We’re currently working on migrating existing resource lists from Talis Aspire over to Leganto. However, reading intentions and notes cannot be moved across to the new system. Reading intentions are resources that you’ve marked as ‘won’t read’, ‘have read’, ‘will read’, or ‘reading now’ and notes are private notes that you’ve added to any resource on a list. Both of these can be accessed from your Resource Lists @ Edinburgh profile. If you have used these features to organise your course reading, and you would like to keep hold of this information, you should make sure to save a copy before Monday 10th July. First, go to the Resource Lists @ Edinburgh homepage (http://resourcelists.ed.ac.uk) and log in using your EASE login. To access your profile, click on your name and select ‘View Profile’. Now click on the ‘My reading intentions’ and ‘My notes’ tabs. All of the books, articles and other resources you have marked with your reading intentions, and your notes, can be viewed here. 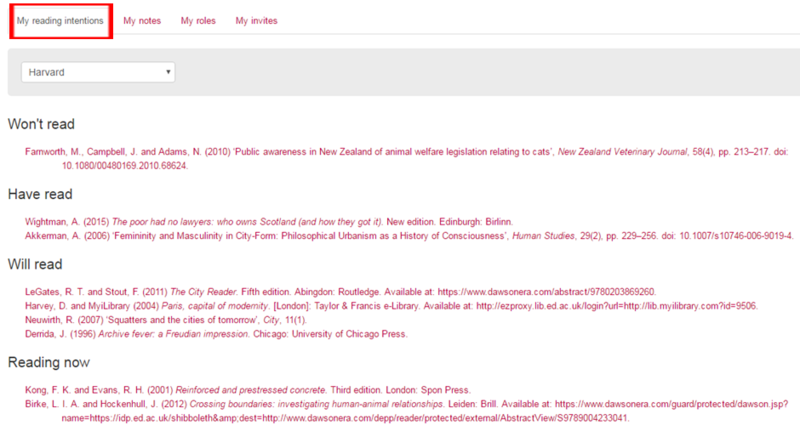 Use the drop down menu to select your preferred citation style. Next, to save your notes and reading intentions, highlight all of the items in the list, and copy and paste the text into a Word document. Right click and paste as text, you will see the full citation details along with your reading intentions and notes and any web address. Please make sure you have saved your copies before 10th July. After this date, reading intentions and notes will no longer be available. Leganto also has features to add reading intentions, manage your course reading and add tags to items. Keep an eye on the blog for further details! This entry was posted in Uncategorized on April 12, 2017 by Louise Dutnell.